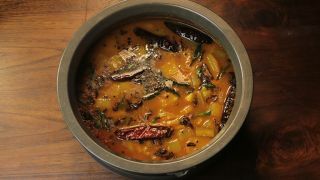 In a pressure cooker, cook dal. To this add cut vegetables and dry curry powder (turmeric, chili), salt and required amount of water. Cook it well. To this mixture add tamarind water. In a pan, add oil and splutter mustard seeds, add dried red chilies and curry leaves. Add this to the curry and mix well.